Regular readers will know that I’m thoroughly sold on the benefits of wired networking for music: no, I’m not going to claim sonic benefits, but for stability and reliability, especially when streaming hi-res music, Wi-Fi just doesn’t hack it. However, for the fun side of network music – for example the ability to access content wherever you are in the house – wireless has clear advantages, to which end I have various bits and pieces of multiroom systems scattered around the house. If you’re starting from scratch, though, you may be on the hunt for ways of ‘wirelessing’ existing systems, or perhaps looking for a way to run a pair of affordable powered speakers in a kitchen, say, to give you music while you cook. And that’s just what the Gramofon is designed to do. I have to say I viewed the initial press release with some amusement, as you might expect given that one of my gigs is as Audio Editor on Gramophone magazine. I dropped the PR person an email requesting a review sample, as I thought a piece on Gramofon in Gramophone might be a bit of a wheeze – and then kind of forgot all about it. Spool forward a month or two, and I received an email alert that a parcel was on its way to me from Madrid, sender unknown. Intriguing, but then I do tend to get sent CDs and the like all the time. However, when the package arrived, it contained two Gramofons. Why Madrid? Well, that’s where parent company Fon, best-known for its Wi-Fi-sharing services, is based. 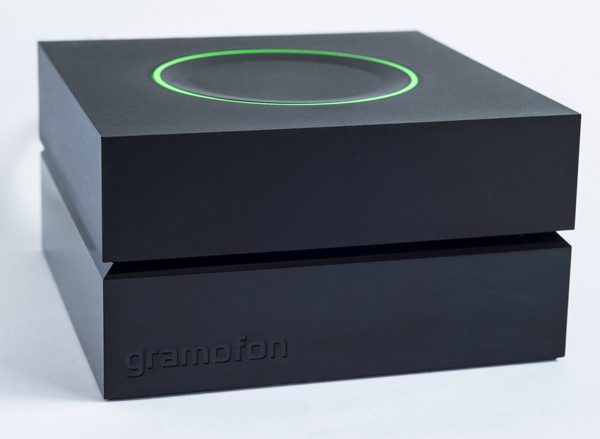 So what is a Gramofon? Well, it’s a little box just over three inches square and less than a couple of inches thick (or 8x8x4.3cm in new money), with a multicoloured ring of light surrounding a pushbutton on the top, and sockets for the supplied mains adapter, Ethernet and 3.5mm stereo analogue out on the rear. It also comes complete with a 3.5mm-to-two-RCAs cable, allowing it to be connected to audio equipment. 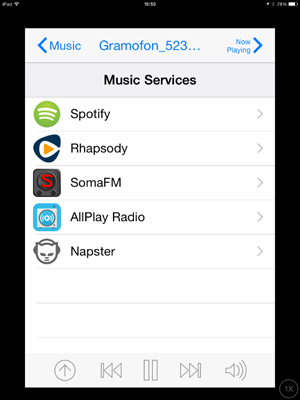 What it does is allow you to access streaming services such as Spotify Connect, Internet radio and music stored locally (via UPnP/DLNA), using your existing Wi-Fi network and apps for iOS and Android tablets and smartphones. You can also stream music direct from your handheld device – using Wi-Fi rather than Bluetooth – and other services, including Tidal, are said to be on the way. 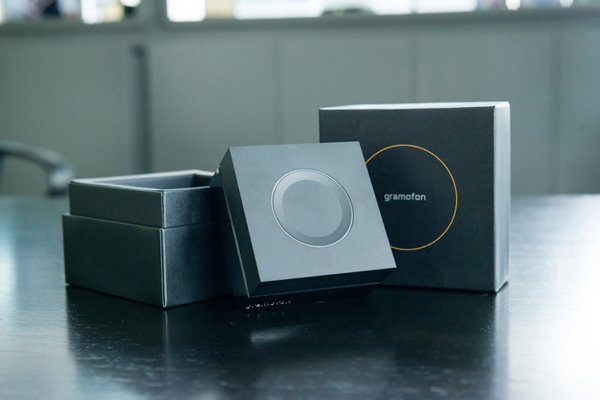 Connection is achieved using a set-up app, which worked simply and effectively – you set the device running the app to connect directly to the Gramofon, then enter your network details – and with the integration of Qualcomm’s AllPlay technology you can connect multiple Gramofons, and then use them individually to access different content in different rooms. Or you can combine them together, with individual volume control via the app, or grouped volume in Party mode, to provide that whole-house hi-fi thing. The top-panel light ring provides status indication: solid red shows the unit is powered up, blinking to indicate ‘ready to set up’, with solid blue for internet connection, blinking if connection isn’t present. There’s also a yellow indicator for firmware updating. Green shows Spotify is playing, and light blue when network music is being played, while the indicator turns pink when the top-panel button is pressed, pausing the music. All very neat, and even better is the price: a Gramofon will cost you just €59, which is a little over £40, delivered, from www.gramofon.com. The unit uses the AK4430 DAC from AKM, which is capable of up to 192kHz/24-bit, but the Gramofon will only handle content at up to 96kHz/24-bit. The good news is it has no problem with 96/24 over Wi-Fi, provided you have a decent amount of signal on your network – and of course you can always revert to a wired connection if it struggles (though this is arguably defeating the whole point of the Gramofon!). In practical terms, I found it was perfectly possible to play everything from classical music to the likes of Rush in 96/24 over the Gramofon, although there was the very occasional drop-out when other devices in the house were hammering the Wi-Fi a bit and I was several rooms away from the router. So how does it sound? Well. You’re probably expecting me to say ‘What d’you expect for £40?’, but while the sound was a little compressed when playing hi-res music into a highly revealing system – using my desktop NaimUniti/Neat Iota system I was able to flick between the Naim’s own streaming section and the Gramofon fed in through a line input – by the time I got down below CD quality things were much more level. And of course there were striking differences when comparing my reference Naim NDS with the Gramofon through my ‘main room’ system, but then you could buy well over 300 Gramofons for the price of the NDS and its 555 PS power supply. Certainly with music played via Spotify Connect there was much less in it between the little black box and the NaimUniti, while streaming radio from the BBC’s services revealed that the Gramofon was only marginally shut-in and hollow compared to the same content via the Naim, which is a pretty good result when you consider the price differential. What’s more, bear in mind the difference in price between the Gramofon and most of the wireless multiroom solutions out there: a Sonos Connect to feed an existing audio system is going to cost you at least six times as much as the Gramofon, as will the likes of Denon’s HEOS Link and similar devices for other multiroom systems. Or, to put another way, you could buy a Gramofon and a pair of little active or powered pro speakers from the likes of KRK, M-Audio or Mackie for around £150, and have a complete smartphone-controlled audio system in any room of the house. And that compares very favourably with even the most affordable packaged network-capable audio systems out there. 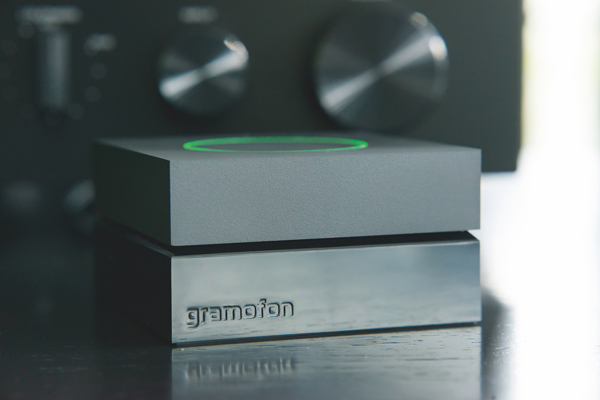 Compact, capable, simple and fun – for the money, it’s hard to argue with what the Gramofon offers. I think I’ve just found the solution to networking my F80, thanks. 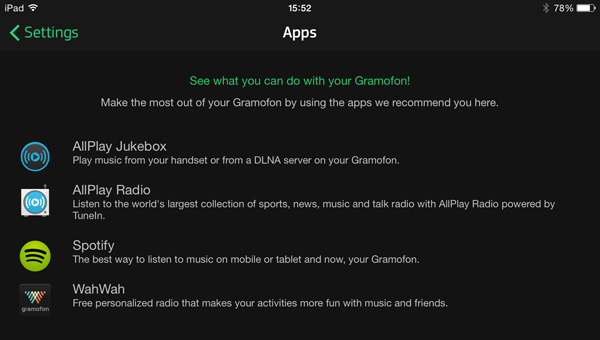 One question – does the Gramafon App com with a UPNP/DNLA player or do you have to use a third party one? And if the latter do you have any suggestions; given I have several thousand albums on my NAS the user interface is important. Oops – posted the comment above then scrolled up the post and realised the answer was in a screenshot – AllPlay Jukebox. So the real question should have been how good is it (and could you use a third party one if you wanted. Thanks. I have a Synology NAS so use their Media Server. Do you have any experience of this, just wondering what Twonky etc do that’s better? Yes, the Synology music server software is OK, but the dedicated MinimServer build is likely to offer improved handling of tags. and thus a more intuitive experience. And it’s free! Andrew – I have just tripped over your blog thanks to Twitter, Jon Honeyball & the Mu-so Qb piece. I am, or soon will be subscribed. Very keen to read up on your experiences with and thoughts on sensible networked music devices (e.g. Gramafon) and approaches to getting it right.